The T17E2 is a Rank I British Self-Propelled Anti-Aircraft (SPAA) Gun with a battle rating of 2.3 (AB) and 1.7 (RB/SB). It was introduced in Update 1.55 "Royal Armour" along with the rest of the British ground vehicles. A very mobile self-propelled anti-tank gun with a dual-mounted .50 cal machine gun, it also has armour rivaling some of the Rank I vehicle and can withstand a majority of the small shells, warranting its high battle rating. The T17E2 has two obvious characteristics. It has wheels, giving it excellent speed and mobility, especially on hard surfaces like rock or roads. The wheels also mean that it struggles in mud, sand or snow. Then there are the guns, the T17E2 is armed with a seemingly light armament of two 12.7 mm (.50 cal) machine guns. Compared to other SPAA of the rank, the armament are light. German and Japanese SPAA are armed with highly potent 20mm auto cannons, which inflict far more damage to aircraft and vehicles alike. Instead, the T17E2 relies on longevity and rate of fire. Wheels are 10 mm thick. Like every other vehicles, the "Parts" and "FPE" modifications should be prioritized so you won't lose your vehicle due to being disabled. After that, prioritize on the different ammunition, aiming for "APIT". Everything else are extra, but still essentials to upgrading the vehicle. Twin 50 caliber machine guns, are good against enemy air targets. Turret transverse, offers good speed for hitting fast moving targets. More efficient than tracked vehicles when turning, due to it having all wheel drive. Wheeled vehicles are slower than treaded vehicles in the water. Cannot pivot turn like a tank, drives like a truck. Has difficulty against heavy armor tanks. 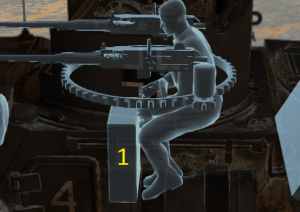 T17E2 Armour is only effective protecting against low caliber machine gun rounds. The T17E2 started as an armoured car requested by US Army Ordnance in July 1941. The request asked for a medium armoured car for combat services. Two companies, Ford Motor Company and Chevrolet, submitted designs to this request, Ford's was an all driven 6x6 wheeled vehicle and Chevrolet's was an all driven 4x4 wheeled vehicle. These two were called T17 and T17E1 respectively, both were powered by two Hercules JXD engines in order to standardize on parts. These two vehicles were to use a turret developed by Rock Island Arsenal with a 37 mm cannon and machine guns, this would house a crew of five. Despite their development, the United States interest on the design waned and were never adopted fully by their armed forces, instead taking in the lighter M8 Greyhound car and using the T17 until the M8 production could be started. Had it been adopted, it would've been designated the M6. 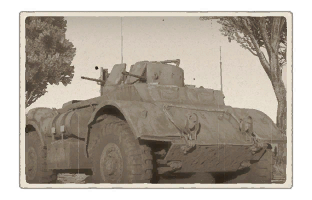 During the T17's development, the British Purchasing Commission was also looking for a medium armoured car that could be used in the current campaign in North Africa. 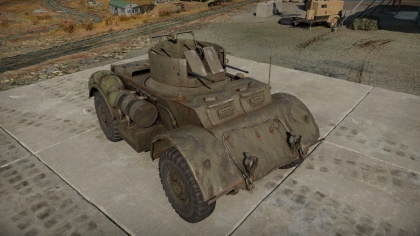 British requirements were a bit different than the American's and asked for the turret of the car to house at least two people and with a radio in the turret rather than in the hull. The British soon adopted the car and named it the "Deerhound", with production starting in October 1942. The T17E1 was also adopted as the "Staghound" and the British requested a production of 300 for testing, after which they then ordered another 1,500 for use. Production for the T17E1 also started on October 1942. When the US Army standardized their armoured cars to the M8 Greyhounds, the British vouched for the T17E1 production to continue for their use, to which the T17 was cancelled in early 1943 and only T17E1 were brought in by Lend-Lease. About 4,000 T17E1 "Staghounds" were produced in total for British use. While the armoured car variants of the T17 served as a light reconnaissance force and armoured car regiments, some were converted into self-propelled anti-aircraft guns. The T17E1 was modified with a new turret developed by Frazer-Nash that equipped two .50 caliber M2 Browning machine guns, this modified vehicle was given the name T17E2. The turret was open-topped, had an electric-hydraulic traverse system, and reduced the number of crew on the T17E2 to three: the commander, gunner, and driver. About 789 Staghounds were converted into the T17E2, also named the "Staghound AA", in the period of October 1943 and April 1944. Skins and camouflages for the T17E2 series from live.warthunder.com. This page was last edited on 23 February 2019, at 01:14.